With the craft beer scene booming throughout the state of Maine, there are several incredible breweries in Boothbay Harbor to choose from. By far, the most popular of them all is the Boothbay Craft Brewery. This family-owned facility produces fresh, local beers with a passion. Each batch is crafted by hand and served with all-natural foods in a warm, friendly atmosphere. It’s the perfect place to unwind after a full day of Boothbay Harbor adventures with a pint of your favorite beer. Here is everything you need to know about the Boothbay Craft Brewery and some of the best things to do during your visit. 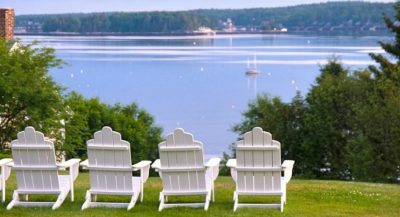 With so many amazing things to see and do in Boothbay Harbor, where do you even begin? Request your free copy of our Vacation Guide and you’ll instantly receive a full list of our area’s top attractions and activities, including more places like the Boothbay Craft Brewery. It’s the only thing you’ll need to plan the ultimate getaway to coastal Maine. In 2005, the idea for the Boothbay Craft Brewery was created in the hopes of making a neighborhood gathering place that thrived from authentic relationships with the community. Four years later, construction began on the tavern using only local timbers and from their very own sawmill. Today, the brewery is one of the neighborhood’s most popular hangout spots and is proud to serve great local beer and food to patrons from all walks of life. The best way to explore the Boothbay Craft Brewery is to take a guided tour of the brewhouse. You’ll learn all about the brewing process and can see the love and care that goes into each brew. This is also a great time to ask the brewmaster some questions! Tours are just $5 per person. After your tour, head over to the Watershed Tavern for a bite to eat. This revolutionary-style brewpub serves excellent farm-to-table fare to locals and visitors from across the globe. On the menu, you’ll find a selection of organic pizzas, crisp salads, tavern-style burgers, and more. Don’t forget to wash it down with a cold one! The Tavern is open for lunch and dinner and reservations are highly recommended. No trip to the Boothbay Craft Brewery is complete without tasting a few different beers. If you’re a fan of American ales, the flagship 633 Pale Ale is ideal. This citrusy ale is very drinkable and has just enough hop presence to awaken the senses. If you’re into dark beers, try the Black Rocks Stout. With heaps of chocolate, caramel, and black malts, it’s perfect for the fall or winter. The most popular among the regular rotation of Boothbay Craft Brewery beers is the Dexter Rippa Red IPA. This red IPA has a great malt-hop balance that brings a citrusy flavor with its Columbus and Centennial hops. Even better, this beer is available in burly 32-ounce cans. Take a look at the Boothbay Craft Brewery menu and find your new favorite beer. Boothbay Craft Brewery is proud to be a member of the Maine Brewers Guild. This organization keeps the state in the forefront of the craft beer revolution. All members of the organization are professional and skilled brewers that produce 99.9% of all their selections in Maine. They are also responsible for creating the Maine Beer Trail, a delicious journey designed for craft beer lovers, so they may enjoy a unique way to try several locally made brews. Today, over 80 craft breweries in Maine make up the Beer Trail. During your trip, be sure to embark on this incredible expedition and win special prizes! Book your favorite room at the Topside Inn today! We look forward to welcoming you to Boothbay Harbor soon.